Seoul is a city with an absolutely fantastic cafe culture. I’m not going to try to rank them–it would be impossible. And there are far too many to visit all of them, anyway. So, instead, I’ll just document some of the best ones I’m visiting during my month here. This post will be updated occasionally. 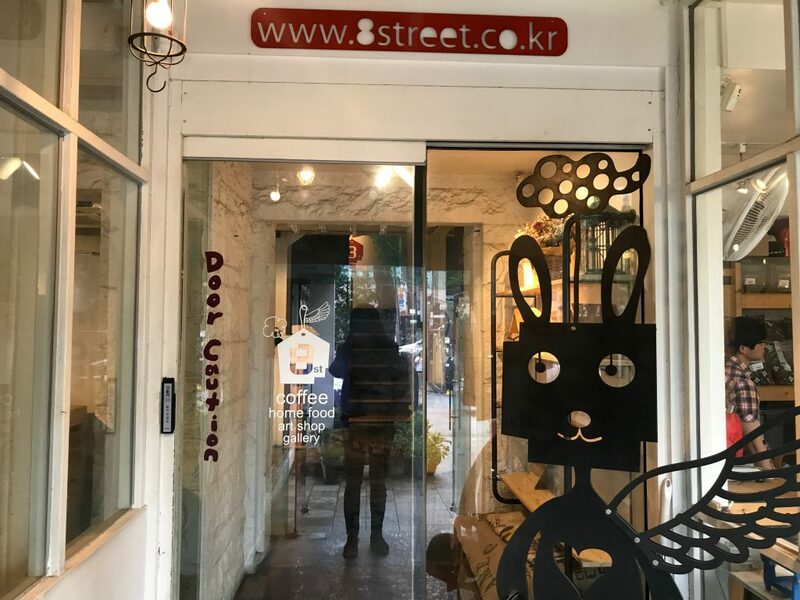 8 Street is more than a cafe, it’s also an art gallery and music venue. Also, they roast their own coffee beans. Basically, 8 Street is awesome. The counter where you order. One problem with not speaking Korean is accidentally getting iced coffees when you order hot ones. Twice I’ve been asked if I want ice, then I say no, and get it anyway. All in all, I can only blame myself since I don’t speak the language. But yeah, this coffee was good, it was the El Salvador Honey. Quite nice. They also have this epic dog which runs around the store and plays with the employees and customers! They have live music shows every now and then! 8 Street is really nice, and you should consider going. Someone tried to mix cafe and color into one word, and sort of succeeded. Cafeolor plays high-energy pop songs and attracts a middle aged crowd of office workers in their large, airy space. There are plenty of plugs, and the wifi was fast. Actually surprisingly good coffee as well–I had to get an americano as there were no pour overs or brewed coffee. Their seemingly decent pastry selection. Cafeolor is on the first floor of Seoul Square mall. Somehow, at least in English, there is no Google Map entry for them now. They also have other locations around Seoul. Jeffrey has long been a favorite of mine, largely because of the great atmosphere. It’s both a cafe and a flower shop. They don’t just use the flowers as decoration–it’s actually a flower shop where you can buy bouquets. A grapefruit “ade”. This type of drink is popular in Seoul. It’s basically fruit bits mixed with some sweetener and added to sparkling water. It’s pretty refreshing and, actually, something worth making at home. Never fear–they also serve coffee, but that’s not the real draw here. Most people are buying ice cream and smoothies and desserts and ades. A great place for a sort of cute kind of date. There is one Jeffrey cafe in Hoegi, sort of near Cheongyangni. The photos in this post were taken at that location. There’s another one near Hyehwa station. The area around Hyehwa is awesome, by the way. Cafe Bronze is an extremely cozy, and somewhat difficult to find, coffee shop. The Google maps location is accurate, but you’ll need to zoom in a bit to navigate the side street. What makes Cafe Bronze special is that they roast their own coffee beans. Thus, the smell of freshly roasted coffee is wafting around the shop, adding to the coziness. The 60’s lamps are retro and fun. It’s never this dark inside, but this picture is badass. A grapefruit ade, similar to the one at Jeffrey. Osulloc sells a variety of tea-based products, including cakes and loose leaf tea. The matcha tea latte is one of Osulloc’s signature items–a must buy. This is the Osulloc in Myeongdong, but there are many, many, many, other locations around Seoul. Look at that beautiful sheen of coffee oil on the top!!! This cup of coffee was so smooth and amazing and god it was good. I love the interior of Sweety Beans. Very comforting and like… I don’t know. Sort of like a college cafe but more refined but also very approachable? Honestly these pictures make the cafe look much worse than it is real life. Inside in real life this place is really really nice. Somehow I really like all the photos on the wall. Look at this window. This is the money shot. This is amazing. This is a place you have to go for people watching. Definitely an underrated spot. If you’re in Seoul, you might want to check out these 12 must-visit destinations, as well as the best vegetarian restaurants in Seoul.